One of my fav from this mighty crew! ooh i love this. Also used to load it to listen to the music. Oh yeah !!! good to ear some sid like this ! This is my all-time fav sid!! 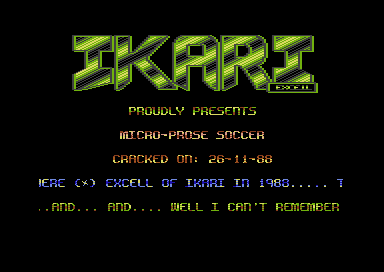 I used to watch this intro (this exact one, Micro-Prose Soccer) just to hear the music ... I ripped this tune from the intro and would just let it play for hours in the background while I was programming ... In case anyone else is trying to find it, its in HSVC (I currently have v5.7) under "/DEMOS/UNKNOWN/Ikary_Intro_Tune.sid" There's also another version of the tune in HSVC under "/Detert_Thomas/Pussy_Slapper.sid"